Confidential helps you and your team to be compliant to legal regulations, contractual obbligations and internal policies, by allowing you to tag files, along with your team. * Tag or auto-tag confidential files, on your disk or on networks and visually spot them while browsing. Tag confidential emails: Outlook will warn you when sending something you shouldn?t! * Tag files with two clicks in Windows Explorer, along with your team, on your hard disk, or on shared drives. 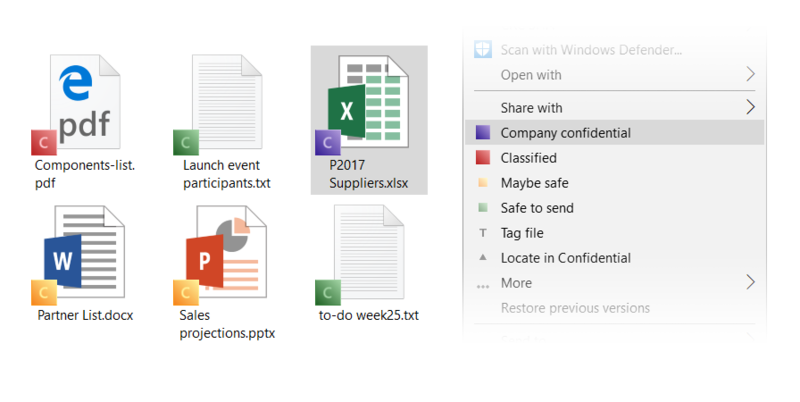 Your whole team will see what files are confidential (or not) in Windows Explorer at a glance. * Auto-tag files, based on their name and location: you can tag a whole drive with few rules within minutes and "watch" folders to tag each new file you put in them. Explorer integration: Confidential ?listens? when you move files between folders: the tagging is preserved * Supports synchronization services like Dropbox, OneDrive, Box.com, Amazon Cloud Drive etc. Works with removable disks, encrypted disks, on any files system (NTFS, FAT32, EXT4 etc.) * Confidential?s Outlook plugin notifies you when you are sending a classified file outside your organization * Manage your projects, files, email and bookmarks, through tags, along with your team. Tag files of any kind, bookmarks and Office documents: Confidential integrates with Office and can write tags also into your Word, Excel and Powerpoint documents * Tag Outlook emails: with our Outlook plugin, you can find your emails quickly and intuitively by combining tags. Confidential?s user interface, to tag emails supports nested tags, text completion, several sorting modes for tags, and much more. * Centralized user and license management, import users from ActiveDirectory, create and manage user groups, for different departments or team and easily manage what you?re sharing and with whom. * Confidential is Azure and OneDrive ready. You can tag files and share your tagging using any cloud storage system. This site does not contain serial number, crack, keygen Confidential Free serial number : serial number is the simplest type of crack. A serial number(cdkey,product key,etc) is register the program as you may already know. a crack or keygen may contain harmful software. If you cannot find the exact version you want, just give it a try. for more information read .nfo/.txt/.diz file include in zipped file.